The assessment of drug toxicity, especially hepatotoxicity, is a critical task in drug development process. To assist with early detection, various in silico approaches have been demonstrated to identify drugs with high hepatotoxicity potential. In this study, based on detailed review on previous reports on drug-induced cholestatic liver injury, we developed a network-based approach to predict cholestatic potential of chemicals using toxicogenomic data. First, the cholestasis network was constructed with 57 relevant genes and 78 connections between genes. 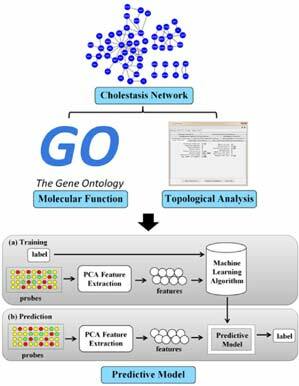 Taking only genes in the disease network into account, the evaluation model was trained by genomic data of 17 typical chemicals associated with cholestasis and yielded the prediction accuracy at 88%. The performance of this model was further challenged by an X-permutation test and an external set of 98 chemicals. Among them, 14 chemicals were marked with high risk of inducing cholestasis by our approach. A survey of published literatures confirmed that 71.43% of our predicted chemicals have been shown to induce cholestatic liver injury experimentally and approximately 93% of them have been implicated to promote liver injury to various extents. Together, we concluded that network-based approaches greatly facilitate further understanding of molecular mechanisms for cholestatic liver injury and this concept could be easily generalized to other biological-relevant side-effect assessments. Chemical-induced cholestasis; Liver injury; In silico modeling; Principal component analysis; Bioinformatics; Network pharmacology. Pharmaceutical Informatics Institute, College of Pharmaceutical Sciences, Zhejiang University, Hangzhou 310058, China.